Shirts With Random Triangles: Big 12 championship game to be held at AT&T Stadium starting in 2017. The new five-year deal with AT&T Stadium, which also hosted the last Big 12 championship game in 2010, will run through the 2021 season. "There is great anticipation with the return of the Big 12 Football Championship and we look forward to hosting the event in AT&T Stadium for the next five years," Big 12 commissioner Bob Bowlsby said in a statement. "The building is a state of the art facility and offers many amenities that will be enjoyed by our institutions and fans." Nebraska's departure from the Big 12 to join the Big Ten in 2011 led to the scrapping of the title game, as NCAA rules at the time requiring conference to have 12 member schools to hold title games. Those rules were abolished earlier this year by the NCAA. 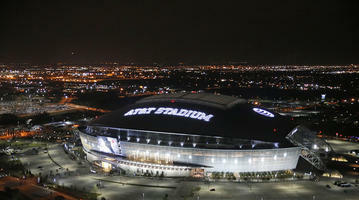 AT&T Stadium was the site of the last Big 12 championship game in 2010, when Oklahoma defeated Nebraska 23-20. The stadium is the home of the NFL Dallas Cowboys, and is the current host stadium of the Cotton Bowl.